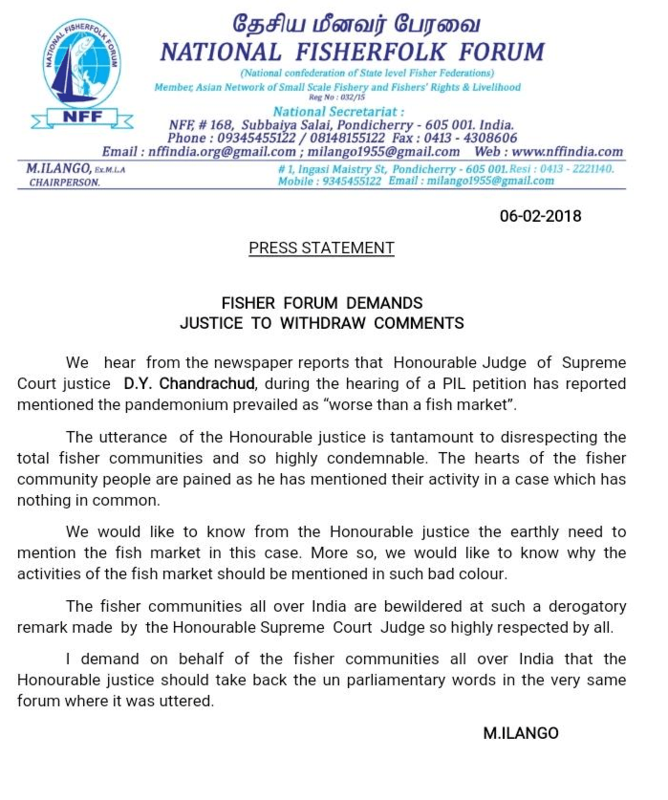 The National Fisherfolk Forum has issued a press statement against Supreme Court Judge D Y Chandrachud. Justice Chandrachud had made the following comment on February 5th. Justice Chandrachud was hearing a case on the Judge Loya death matter in the apex court where he made the remark. The raging noise and debate in the courtroom by senior advocates Dushyant Dave and Pallav Shishodia had reached to such a level that Justice Chandrachud had to intervene. The remarks of Justice Chandrachud have now angered the National Fisherfolk Forum, a national confederation of state-level fisher federations. They have taken offence to being compared to the lawyers and have expressed their pain and displeasure as they claim that the sentiments of the entire fishing community have been hurt. They have asked Justice Chandrachud to withdraw his remarks ‘in the same forum’ where it was uttered, that is, in a courtroom of the SC. They have also mentioned that they have found the remark derogatory. The Judge Loya death case has seen many dramas inside the courtroom. Earlier too, Justice Chandrachud had to reprimand the advocates and assert that the SC needs to look at all the aspects of the case and cannot base their hearing on articles of Caravan, Indian Express, The Wire and The Scroll. Advocate Dushyant Dave on that day had even tried to argue that Harish Salve should not be allowed to participate in the case, simply because he had appeared for Amit Shah. Justice Chandrachud had shut down that argument too. It is indeed amusing that fisherfolk, who were not the actual targets of the Judge, have taken offense to this comment, whereas the real targets i.e. the lawyer community do not seem to have been offended. Perhaps it is the air of “intolerance” which has made our fisher folk angry!